One of my favorite classic games is Tetris. My most fond memories of Tetris are most vivid from high school where me and my classmates connected two TI-86 calculators for multiplayer Tetris. Unfortunately, Tetris has taken a side burner to other graphic intensive PC and console games. Now that a majority of us have smartphones with a solid data connection in our pockets, it's a great time to revisit the classic game of Tetris. 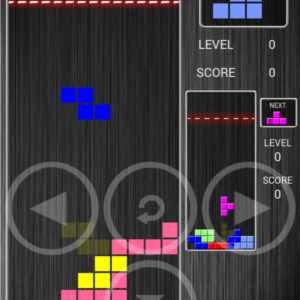 I decided to find, download, and install the best available Tetris app for my android. And Block VS Block was the first app I found on the Google Play store. What Does Block VS Block Offer? A Single Player Mode where you stay alive. With each level, the speed of the pieces speed up. A Multiplayer Mode against a computer AI of varying difficulty. This is the same as Single Player, but random rows are added to the bottom of the stack whenever the opponent clears more than one row. There are special items that allow you to add or subtract individual blocks on the stack. My biggest dislike of smartphone games is the challenge of efficiently fitting all the keys onto the screen alongside the gameplay. But Block VS Block has solved the problem. Since Tetris and Tetris-style games only require four keys: up, down, left, and right, Block VS Block has cleverly overlayed those four keys over the gameplay. The keys do not conflict with gameplay! The perfectly designed gameplay is the best feature of Block VS Block that makes it difficult to put down the game. Thanks to the awesome gameplay experience, I got just enough time to get accustomed to the new pieces. Due to the new pieces, some of the original strategies of piece placement classic Tetris are no longer apply. In fact, it is a whole new learning process to discover the new strategies. After less than an hour of gameplay, I was already accustomed to the new pieces. The next thing to get accustomed to is the special items. Some of the special items include removing blocks one at a time off the stack, while others include adding blocks on at a time. Other special items include clearing an entire vertical of blocks. The problem here is there are no instructions anywhere that describe the effect of special items or how to get them. After awhile, I've learned the way to activate most special items in Block VS Bock is to press the up key. The special items are a nice addition to the classic Tetris game, and if you don't like it, special items can be disabled in the settings menu. In regards to Single Player vs Multiplayer, the fact of the matter is that Single Player mode is very boring! The speed of piece dropping does not increase fast enough, making one session last forever. On the other hand, the only way multiplayer mode works is against the AI. And though the modes are challenging, it would be much more exciting to play against other people. Unfortunately, Block VS Block lacks a truly multiplayer mode where you can compete against real opponents. This was one reason why I eventually decided to uninstall Block VS Block. The main reason I stopped playing Block VS Block on my Android is the sheer number of ads. Before any single or multiplayer game, there is a full screen advertisement. Sometimes, it's a quick banner that can be instantly closed via the lose button. But in other instances, theres are 30 second video ads, often times for other apps that cannot be skipped. This was too much for me and is the ultimate reason why I decided to uninstall Block VS Block. So the hunt continues for another Tetris styled app that has easy controls, the original Tetris pieces, and a multiplayer mode that allows other players to join in the fun.